Youngsters with heart for nature came together twice a week for the entire schoolyear to learn about nature and also have fun with their peers. All this culminated on Friday evening June 24th when certificates stating all their achievements and their new ranks were awarded. It was a very nice evening where the Junior Rangers demonstrated their public speaking skills and other abilities, leaving even their leader Desiree Croes flabbergasted. Commissioner Mrs. Rolanda Hellburg-Makaai gave out the certificates. De STINAPA Junior Rangers are an example for the Caribbean Region. STINAPA and Junior Rangers are getting invitations from countries in the region with the request to help set up a similar program. 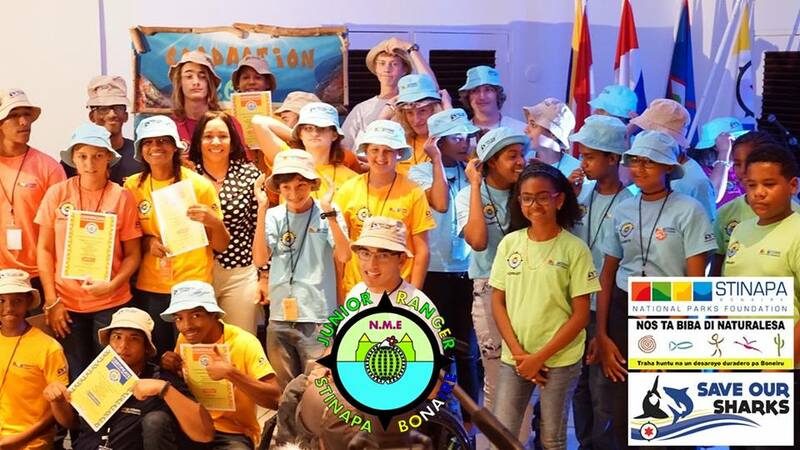 Desiree Croes, STINAPA Coordinator for the department of nature and environmental education said during her speech that the program is based on 3 important principals: Motivation, a common goal and support from the community. According to Desiree, especially that last part is very important for the program. Without support from volunteers and businesses in our community the program would never have become successful. The volunteers: Suzi Swijgert, Monalisa Domacasse, Kevin & Sue O’Brien, Diana Gevers, Kim White, Danielle Noeken, Bette Eitze, Sabine Engel, Paulo Bertuol, Chris Ball, Robin Wiesse, Pat & Bruce Davies, Johan van Blerk i Luigi Eijbrecht. Companies and other organizations that in an outstanding way contributed to the program are: Cargill NV, Echo Foundation, VIP Diving, Dive Friends, CIEE research center, Dutch Caribbean Nature Alliance, Coral Reef Restoration Bonaire, Jong Bonaire, Raynel Cicilia (Ray Production), Theo Knevel (CRESSI) i Proyekto Stormvogel. Companies and foundations that support the program: Sea Turtle Conservation Bonaire, Mangrove & Info Center, Gooodive, Carib Inn, Divi Flamingo Beach Resort & Casino, Dive Bonaire, Multi Post, Alfa & Omega, Rent-O-Fun, Great Adventures Dive Shop.